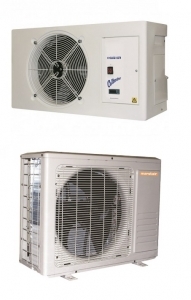 The Marstair CXE – CKC range of low temperature cellar coolers can control down to a lower control temperature than the standard rage, this being 4 °c control temperature (dependent on unit selection). They also have the benefit of having longer avialable distances between the indoor and outdoor unit depending on the selected model. This model the Marstair CXE 30 evaporator (indoor) unit and the CKC20 condenser (outdoor unit) and is suitable for areas typically up to 25 square metres.